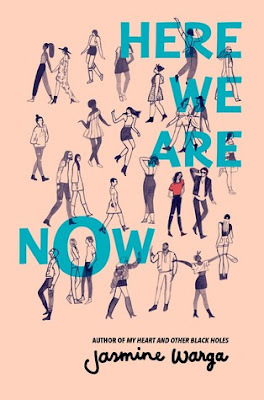 I was really excited to get started on Here We Are Now by Jasmine Warga. I had read her previous book, My Heart and Other Black Holes a few years ago, and it was one of those stories that really stuck with me, so I was curious to see how this one would compare. Since she was thirteen years old, Taliah has guessed at whom her father was, but has never met him, and her mother has never named names. Based on evidence that Taliah has discovered, but never told her mom about, she thinks that her dad may be rock star Julian Oliver. When Julian arrives on her doorstep one afternoon out of the blue, Taliah begins to think she may be right. And when he asks her to take a road trip with him to meet the family she’s never known, as well as her dying grandfather, she decides to go, to discover all the things she’s missed out on for so long. The storyline for this book was definitely different from that of that of Jasmine’s previous book. While it did touch bases on important things throughout the story, the storyline was pretty upbeat. And, coming in at right around 300 pages, it was a really quick read as well. I actually ended up listening to the audiobook for this, which I surprisingly found on Hoopla* on the day book was released, and since I’m all about audiobooks lately, I decided to check it out in that format instead. I’m so glad I did! Soneela Nankani did a great job narrating the book, and I really enjoyed having her read the story to me. Overall; Here We Are Now by Jasmine Warga was a quick and interesting read, and I’m so glad to have had the chance to read it this month! I’m really looking forward to reading more by Jasmine in the future as well, and I’ll be keeping my eye out for her next book, Other Words for Home, which is due to release in 2018! *Hoopla is a digital media service offered by my local library! It has an amazing assortment of audiobooks, and also offers ebooks, movies and tv shows as well.